Gyudon (literally Beef Bowl), is a bowl of rice topped with tender beef and onions simmered in a tasty salty sweet sauce. It is commonly served with beni shōga (pickled ginger) and shichimi (ground chili pepper), and sometimes topped with a raw egg. "Gyu" means beef and "Don" is short for "donburi(rice bowl)". Gyudon can be found in many Japanese restaurants and some fast food chains specialize exclusively in the dish. Well known Gyudon chains in Japan are Yoshinoya (吉野家), Sukiya (すき家), and Matsuya (松屋). At some restaurants, you can specify how you want your Gyudon served, like tsuyudaku (extra tsuyu broth)! 1. Cut onion into wedges. 2. Put A in a pot and bring to a boil. Add the beef and onions, remove the foam (dirt), then simmer on low until the liquid is reduced to 1/3. 3. 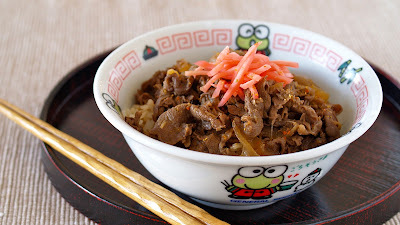 Serve cooked rice in a rice bowl, place the simmered beef, pour some soup on it, then garnish with Beni Shoga. You can additionally sprinkle with Shichimi Togarashi and/or garnish with boiled eggs if you like. Partially freeze a block of meat or partially thaw a block of frozen meat, then thinly slice it.